You are here: Home / Entertainment / Come to Freedom Hill-Rudolph needs HELP! Come to Freedom Hill-Rudolph needs HELP! Santa put Rudolph in charge of pulling the sleigh this year and he needs your help getting the stable ready, finding and gathering the reindeer, and making sure they are rested and ready for Christmas Eve. 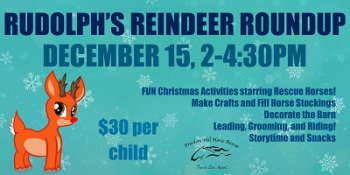 Come and enjoy a fun filled afternoon of stories, decorating, crafts, “reindeer” rides and more! $30 per child – Parents welcome!